See more objects with the tag communication, graphic design, advertising, water, asymmetry, seasons, triangles, sales, promotional poster, boats, summer. See more objects with the color bisque rosybrown dimgrey darkkhaki sandybrown or see all the colors for this object. This is a Poster. It was designed by Edward McKnight Kauffer and made for (as the client) Derry & Toms. It is dated 1919 and we acquired it in 1963. 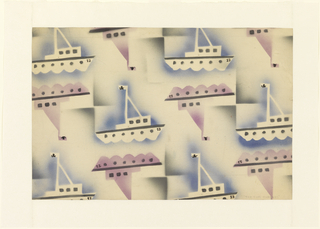 Its medium is lithograph on paper. It is a part of the Drawings, Prints, and Graphic Design department. American-born painter and designer E. McKnight Kauffer worked in England from about 1915 to 1940, where he became well-known as a top modern poster designer. 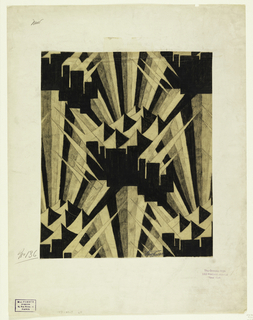 He is particularly noted for his more than 150 designs for the London Underground. Kauffer was one of the first designers to apply fine-art principles to advertisements, seeing fine and commercial arts as harmonious rather than distinct. He advocated simplicity in poster design, noting the poster and message had be to seen and understood quickly by a fast-moving pedestrian or car passenger. 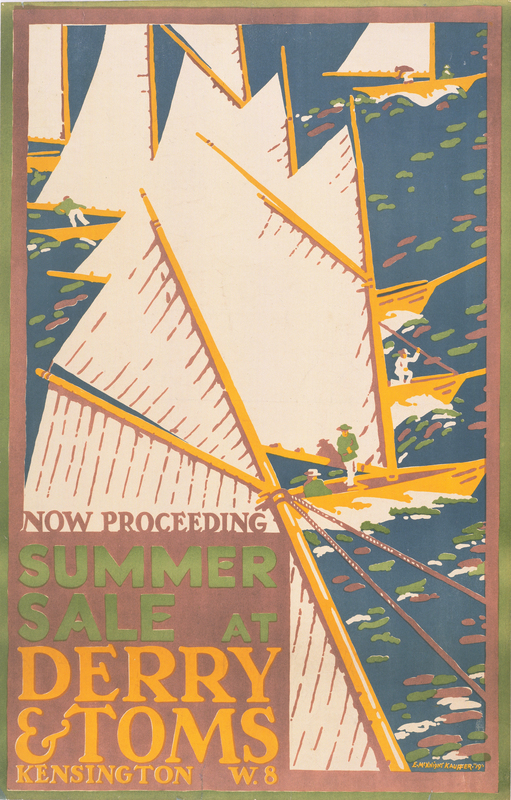 This poster for a summer sale at Derry & Toms, the London department store, communicates the feeling of summer in a simple, colorful scene of sailboats created through a mix of Japanese woodcut, expressionist, and Fauvist influences. Derry & Toms was one of the most successful companies to follow in the tradition of modernist posters set by Kauffer in the London Underground Railway. This object was donated by Mrs. Edward McKnight Kauffer and catalogued by Karin Zonis and Kristina Parsons. It is credited Gift of Mrs. E. McKnight Kauffer. Signed in print, lower right: E. McKnight Kauffer. "19"